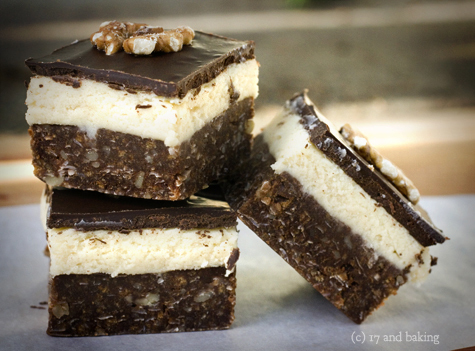 Here in Washington state we don’t get nanaimo bars, or at least I’ve never seen one. I’ve seen them on Tastespotting and thought they looked good, so I was excited to see that they were this month’s challenge. Unfortunately, I can’t say that I liked them. I have a sweet tooth, but even without the maple flavoring, these were tooth achingly sweet. They were also much too rich in the way that an overly buttery buttercream is too rich. 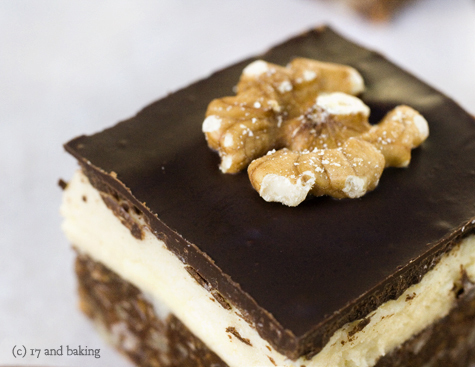 Nanaimo bars have three layers – chocolate on top, a middle buttercream layer, and a cocoa-coconut bottom layer made with graham crackers. For the chocolate layer, I used some unsweetened chocolate to tWe were encouraged to make gluten-free graham crackers for the challenge, but I didn’t have the ingredients on hand and made the original recipe instead. It just so happens I’ve made this exact graham cracker recipe before for my Autumn S’mores, so I’ll give the gluten-free version below. Divide the dough in half and return one half to the refrigerator. Sift an even layer of sweet rice flour onto the work surface and roll the dough into a long rectangle, about 1/8 inch thick. The dough will be quite sticky, so flour as necessary. Cut into 4 by 4 inch squares. 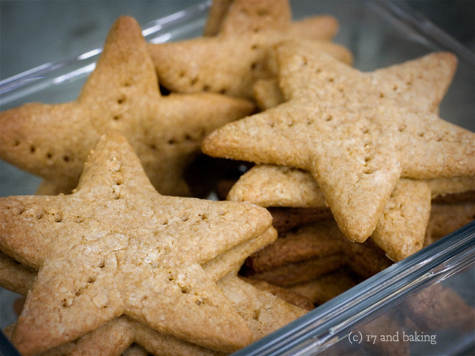 [To make things easier on myself, since the bars just need crumbs, I used a cookie cutter to quickly cut out stars.] Gather the scraps together and set aside. Place wafers on one or two parchment-lined baking sheets. Chill until firm, about 30 to 45 minutes. Repeat with the second batch of dough. Adjust the rack to the upper and lower positions and preheat oven to 350 degrees Fahrenheit (180 degrees Celsius). Gather the scraps together into a ball, chill until firm, and reroll. Dust the surface with more sweet rice flour and roll out the dough to get a couple more wafers. Prick the wafers with toothpick or fork, not all the way through, in two or more rows. Bake for 25 minutes [more like 12], until browned and slightly firm to the touch, rotating sheets halfway through to ensure even baking. Might take less, and the starting location of each sheet may determine its required time. The ones that started on the bottom browned faster. 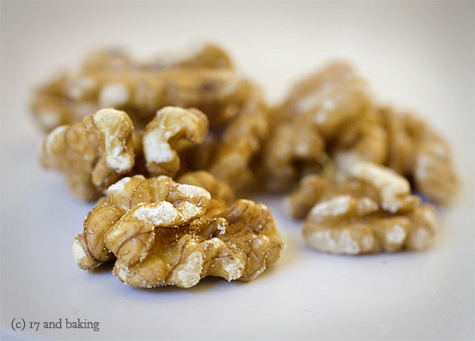 To make crumbs: When cooled completely, place enough wafers in food processor to make 1 ¼ cups (300 mL) of crumbs. Another way to do this is to place in a large ziplock bag, force all air out and smash with a rolling pin until wafers are crumbs. Melt unsalted butter, sugar and cocoa in top of a double boiler. Add egg and stir to cook and thicken. Remove from heat. Stir in crumbs, nuts and coconut. Press firmly into an ungreased 8 by 8 inch pan. Cream butter, cream, custard powder, icing sugar, maple syrup, vanilla extract, and cinnamon together well. Beat until light in colour. Spread over bottom layer. Melt chocolate and butter over low heat. Let cool to room temperature. When cooled, but still liquid, spread over the top of the bars. Entry filed under: Bars/Brownies, Daring Bakers. Tags: bars, buttery, chocolate, coconut, Daring Bakers, nuts, walnuts. My daughter and I have been watching every day to see your next post. I had a feeling something was going on. I want you to encourage you that you are working that stuff through in a very healthy way. We can’t deny that hurtful comments hurt us, but what we do after we recognize that is key. Do we let those statements define us? Push us off track? Steal our passion? Or do we move on, doing what we love and encouraging others to do the same? No, you aren’t perfect—(I know I’m not! ), but you are sharing your passion with us and it has inspired my 11 year old to try and start her own blog. So keep your chin up and keep those great recipes and pics and words coming! Your posts continue to interest, to delight, to inspire many readers who, like me, lurk rather than comment. Today I felt my spirit lift as I read through the comments above, full of affirmation and support. Thank you for sharing this experience, and congratulations on moving through it with grace and maturity. I wonder if you truly know how it is that you inspire people. It bothered me to learn that there are people who were hurtful towards you or your talents. I look forward to watching you grow as a person, as more and more of your life experiences will enhance your blog even more. Thank you for inspiring me. Your blog is sometimes the pick-me-up that I need to get through my hectic days. You are a true gem. :) Your mom and dad must be so proud. :) I don’t even know you, yet you make ME proud. Keep up the good work–there are many people who love your talents and love that you share them with others. Just found your blog via the weblog awards and I’m addicted. Opening your page is like entering a spa…so relaxing and inviting. Looking forward to what you do next. p.s. 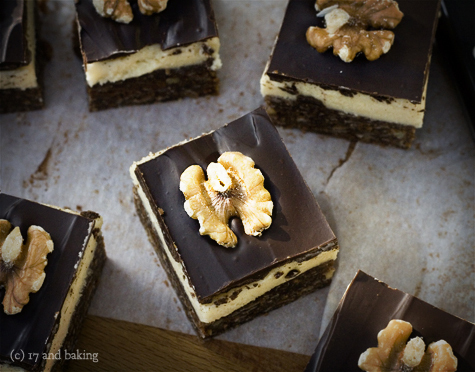 how on Earth did you manage to slice those bars so perfectly?! Elissa… you’re blog is by far one of the most fun, visually beautiful, recipe tempting, and most importantly joyful blogs around. keep up the awesome work… i read your posts, see your pictures and it makes me want to roll my sleeves up, pull out my kitchenaid mixer and get started on something new. i even blogged about you on my blog this week (your tiny peanut butter chocolate chip buttons were the subject of conversation)… thanks for being fun and yourself. keep doing what you are doing and ignore the nay-sayers. Thanks for the reply and for the “chef’s secret” on slicing perfection. Not only am I lovin’ your blog but now my daughters (13 &10) are hooked. Keep up the fantastic work, YOU ROCK (as my 10 yr old would say)! Some people are not happy unless they’re putting somebody else down. Sometimes there’s some truth in a comment and you can take something from it, learn from and grow from it. Sometimes you just have to look past it and move on. This is my first time on this blog and I have to say it’s very well put together. You also take pictures that make the food look worth trying. Keep working toward your goals. Remember that there will always be people there to discourage you, but you’re strong enough to push past them and continue onward. 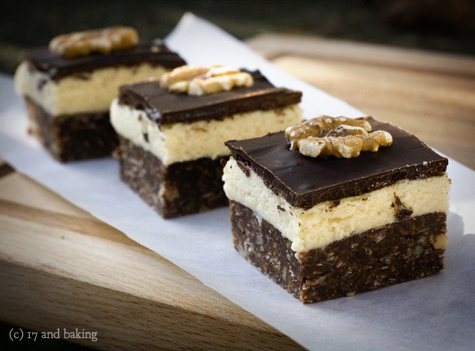 Great looking nanaimo bars! I like the use of the maple in them. Remember this post, and how you felt when you wrote it. Not everyone will always love what you have to say, but you are a bright 17 year old with maturity beyond your years. You’re great at what you do and humble enough to know you can be better, and that humility makes you honorable. I’ve recently received some anonimous hate comments on my blog, and the only thing I can say is: how can someone HATE a BAKING BLOG? Maybe this person is on a very hard diet, or is just jealous of your talent, or hates little kitties and knitting grandmas too, who knows? I don’t think you should care about it, because you have one of the most beautiful food blogs out there, and you are only 17! Don’t take the negativity personal because they don’t even KNOW you! BTW, I do have a sweet tooth, but this was even too sweet for me:) LOVED making/eating the graham crackers though!!! i have sporadically followed your blog over the past few months and have greatly enjoyed your posts — you are clearly an incredibly creative person with a lot of talent. your detractors…or anyone who would ask “who cares” about your blog.. are jaded and wish to pass on the lack of support end encouragement that they must have received in pursuing their passions and dreams. lots of people care. it isnt just about delicious food and beautiful pictures, although you are well covered in both those departments. it is about taking a risk, sharing a piece of yourself and your creativity — your art — with the world. lots of people love to cook and bake and do it because they enjoy it, including myself, but you have true talent. this is a good lesson to learn early: at every stage of your life there will be people there ready and willing to take you down a notch, to take the wind out of your sails and to rain on your parade. there will be people who tell you you cant succeed, shouldn’t pursue your passions, that nobody cares, etc. they are wrong. prove it to them. Your blog is on Smitten Kitchen’s read list. I’m impressed with you at your age doing this. It is hard to not let people’s words get to us, but they do. And I’m glad you were able to persevere and become the better for it. This post is lovely, because it doesn’t degrade the people you felt belittled by; rather, there is an eloquence about your struggles. That’s what makes a good writer. P.S. 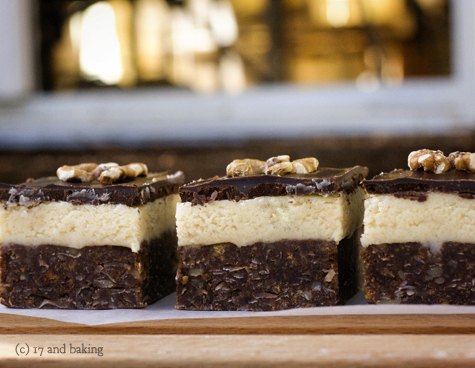 I’m surprised that you’ve never had a nanaimo bar in WA. The origin is from British Columbia on Vancouver Island. But I agree with you about being too sweet–not big of a fan either. Do the Gram waffer crumbs need to be gluten free?? You are an amazingly talented young woman! Never doubt your abilities due to some random comment from left field. YOU ROCK! I like your blog. Love your writing..” pebbles of cruelty and silt of snide”! perfectly phrased! Also, there are nanaimo bars in Washington. I think they’re mostly in little cafes, the cute ones that aren’t chains or anything. These look delicious and I will surely make them sometime soon, even though they’re over the top in sugar :P Tania tries to convince me to half the sugar in recipes but I am a stubborn American and do not listen. Just came across a link for your blog last night and fell in love with the flavour combinations for cupcakes, not to mention your deft icing skills & beautiful photography. I’m Canadian, and I have never seen a blog post about Nanaimo bars, let alone those awesome Christmas treats being mentioned outside of a Canadian Living magazine. As I’ve been living in the US for some time now, I do get hankerings for some of the deserts I grew up on, these being one of them. Thank you for sharing! Actually, you know what would be cool? But this is a completely unsolicited suggestion: deserts that have cultural significance in other countries. I was noticing that you have followers from all corners of the world, it might be nice to represent some of those followers through food. Food = Culture. Also, I see that you adapted the graham wafer biscuits from Heidi Swanson’s 101cookbooks blog- love her two. You and Heidi are definitely my favourites. Keep up the great work, and enjoy college! You always make me cry….Love the way you write and the love that you share with your family. I have a daughter living outside of Boston (Cambridge) and I love it when when she comes home and HATE it when she leaves. But you all need to grow on your own and make your own way. It seems that you are both doing just that, and in a very impressive way. Good Luck with all that you do. You are so talented and anyone with a shred of sense can see that the minute they read a word of your writing or look at one of your photos (I still cant believe that you are only 19). I adore your blog and only wish you posted more often. Hi Elissa! I’m a relatively new blogger with a very small blog… I can’t believe that people actually had the gall to say cruel things – where do they get off? It’s also the biggest fear that I happen to have…. I discovered your blog yesterday and I have to say yours is undoubtedly the most pleasant blog I have ever read. I know what you mean about losing your voice. Whenever I have something to say, something that’s really bugging me, but choose not to, the result is verbal constipation. I end up not saying anything I truly mean, until I can no longer contain myself and I finally speak up about the thing-that-should-not-be-mentioned, and all is well again. I just want to say that I am an eleven year-old from New Zealand and I am TRULY OBSESSED with your blog. Not something that your mom wore to her prom back in the dark ages. occasion, footwear, bags, and evening dresses are on prime of their priority list. out and make sure everything is okay on your body.